Penmanship paper with dotted lines. In case you haven't noticed, your Facebook news feed is flooded with back to school pictures of kids smiling ear-to-ear in their new outfits while clutching new lunchboxes and back packs. I've already told you about my favorite 1970s and 1980s school supplies. 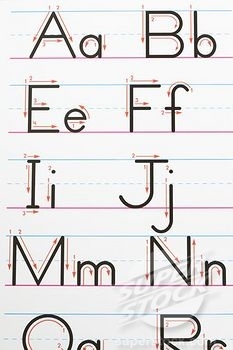 One thing I sort of forgot about was the big, wide lined penmanship paper from back in the day! I believe we used this in first and second grade. 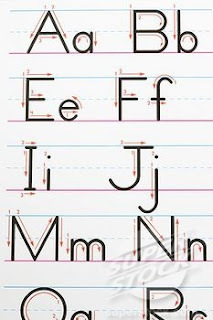 Remember how difficult it was to write the alphabet? I don't miss those days. Now all we do is type. I rarely write notes anymore. Even shopping lists can be emailed to my phone. My students compose their essays and send them to me. I grade them and send them back and never once does pencil or pen touch a paper. I'm okay with that since my handwriting is not the least bit attractive. I just bought a pad of this paper so I could teach my son to write before he goes to preschool. It's so hilarious. Did you know most schools don't even teach cursive anymore. At first it bothered me, but then I realized there isn't much of a need for it. Penmanship is a lost art. Those pages were such a big part of my childhood, it's hard to believe they don't use them anymore. Really? How sad. My little nephew, whose just starting school, is brilliant at everything except writing. Of course, he can teach me things on a computer. Agreed - penmanship is a lost art in today's world. I miss hand-written letters. Then again, with the state of the Postal System and the high price of stamps, I know why email is more attractive. Times changed. Glad I can remember both eras. I just now learned that the lowercase j drops down into the bottom row. I am freaking out right now. Fiddle Faddle - Grandma & Grandpa Loved It!